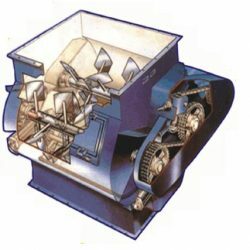 Toshniwal Mixer is an absolute choice in front of Extruders for manufacturing direct expanded ready to eat (RTE) Food cereals such as corn curls, Collect, Onion Rings, Potato Chips or Fingers etc. Toshniwal offers new generation powder mixer which gives a homogeneous mix in a very short time (30-60 seconds) for dry powder. The mixer has a facility for spraying liquid to ensure uniform coating on powder / pellets as well as lump breaker. The food industry today can be represented in 4 categories in the market. One of such categories is the "Ready to eat" food which is most popular than the others such as : Staple Food, Snack Food and Confectioneries. Micro-nutrient Fortification of staple foods accepted international level to improve lives and accelerate development at such low cost and in such short time. "Quality is the centre of everything we do " …… Always has been and always will !